There was a great boxing match at the Texans and Titans game when a football game also broke out. Otherwise, there were a couple of great games from this past weekend. Houston Texans 20, Tennessee Titans 0. This game hit the highlight reel not for the football, but rather for the boxing. Houston wide receiver Andre Johnson and Tennessee cornerback Cortland Finnegan were smack talking throughout the game, but by the fourth quarter, the talking was over. Finnegan escalated the confrontation by slapping Johnson’s face mask, after which Johnson ripped Finnegan’s helmet off and started throwing punches. Johnson clearly got the better end of the fight, landing a couple of punches, but both were of course ejected from the game. The Titans’ offense struggled in this game with rookie quarterback Rusty Smith who threw three interceptions and only passed for 138 yards. Smith took over after the regular starter, Vince Young, was benched last week with a thumb injury. Young is now on injured reserve, so things aren’t looking good for the Titans. San Diego Chargers 36, Indianapolis Colts 14. This game was a rough one for the Indianapolis Colts’ star quarterback, Peyton Manning. The Colts suffered several key injuries to their receiving corps, but Manning has been making the most of the players that he has until last night. Manning threw four interceptions in one game for only the third time in his career. On the other side of the ball, San Diego quarterback Phillip Rivers had a quiet night, only throwing for 185 yards with no touchdowns. Rivers has statistically been one of the best quarterbacks in the league this year, though, so his stock is on the rise while Manning’s is beginning to fall. 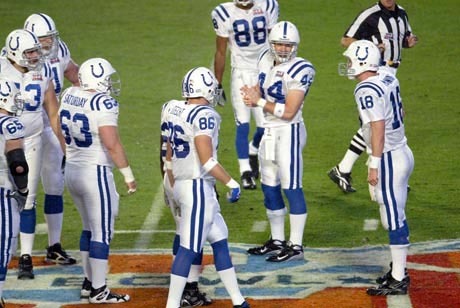 Fans should not have been surprised at this result, though—the Chargers historically give the Colts a hard time, winning five of their previous six contests. Pittsburgh Steelers 19, Buffalo Bills 16. The poor Buffalo Bills. Winners of only two games this season, they were primed in this game to knock off one of the NFL’s better teams, the Pittsburgh Steelers. But then they remembered they were the Bills. After rallying to get a game-tying field goal to send the game to overtime, the Bills moved the ball and looked like they had the game winning touchdown on a pass from quarterback Ryan Fitzpatrick to wide receiver Stevie Johnson. And then Johnson dropped the ball. The Bills punted the ball back to the Steelers, who, you guessed it, won the game with their own field goal. Atlanta Falcons 20, Green Bay Packers 17. The Falcons are emerging as one of the NFL’s better teams this year. Despite getting torched by Green Bay quarterback Aaron Rodgers for 344 yards passing, the Falcons’ defense held when it had to and gave their offense a chance to win it. Even though Green Bay scored a touchdown with a little less than a minute left in the game to tie it at 17, the Falcons didn’t seem too worried. They marched the ball down the field quickly behind quarterback Matt Ryan and hit a 49-yard field goal with just 9 seconds left to win it. -The Chicago Bears contained Philadelphia quarterback Mike Vick on Sunday, sort of. The Bears’ defense sacked Vick four times and forced him into two interceptions, although Vick still passed for over 330 yards. The Bears did enough, though, to hold on to the 31-26 victory. -Although the Bills are pretty bad, they can take solace in the fact that they aren’t the Carolina Panthers. The Panthers have only won one game this year. They had a chance on Sunday against the Cleveland Browns, but their normally reliable kicker, John Kasay, missed a game-winning field goal to hand the Panthers another loss. -Browns’ running back Peyton Hillis is emerging as one of the top runners in the league. He had 131 yards and 3 TDs on Sunday against the Panthers.